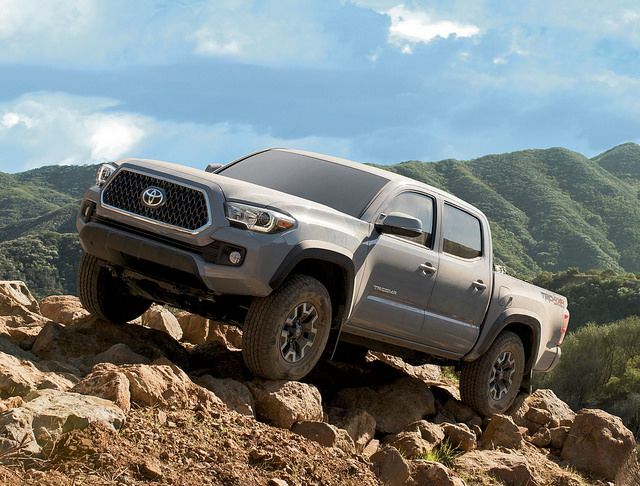 Despite increased competition from segment newcomers, the Toyota Tacoma continues to lead the midsize truck segment thanks to superior performance, styling, and features. The 2020 Toyota Tacoma will boast a number of new upgrades that should keep it at the head of the pack. The 2020 Tacoma ushers in the third generation of this efficient and advanced pickup. As part of this new generation, the Tacoma will boasts a new grille design and wheel design on almost all trims. Toyota has also upgraded the multimedia system, now with Apple CarPlay™ and Android Auto™ smartphone integration for easy access to apps on the go, as well as Amazon Alexa™ compatibility. TRD Pro models in particular will get a number of new features, including a sequential LED headlights, a new wheel design, and a new exclusive Army Green colour. Inside, TRD models get new 10-way power seats and Smart Key functionality. TRD Pro models aren’t the only Tacoma grades to get specific upgrades for 2020. The Tacoma SR model, for example, gets an intermittent wiper and new grille design, as well as a larger touchscreen (7 inches). Tacoma SR5 models get a new 160-inch dark satin wheel colour and upgraded fabric design for the seatbacks. Visit High River Toyota for details on all the 2020 Tacoma upgrades. The Toyota RAV4 revolutionized the crossover segment when it first joined Toyota’s lineup, and now the 2019 Toyota RAV4 Hybrid seeks to be just as groundbreaking. The RAV4 Hybrid is available across five models and delivers best-in-class fuel economy from the 2.5-litre Dynamic Force four-cylinder Atkinson Cycle Engine, which makes 219 net horsepower. Specifically, this engine delivers 5.8 L/100km in the city, 6.3 on the highway, and 6.0 combined. 2019 Toyota RAV4 Hybrid LE: Comes standard with a 7-inch display audio system with Entune 3.0 Audio, as well as Toyota Safety Sense 2.0. 2019 Toyota RAV4 Hybrid XLE: Adds 17-inch alloy wheels, a power back door, a power moonroof, projector LED headlamps, and a heated leather-wrapped steering wheel. 2019 Toyota RAV4 Hybrid XSE: Offers sporty performance thanks to 18-inch alloy wheels, a sport-tuned suspension, and more. 2019 Toyota RAV4 Hybrid XSE with Technology Package: Adds a number of technologies to the XSE grade, including a nine-speaker JBL Premium audio system with Clarify technology. 2019 Toyota RAV4 Hybrid Limited: Adds numerous luxury features, including chrome exterior door handles, hands-free gesture power back door, and heated and ventilated front seats. Stop in at High River Toyota this spring to test-drive the new RAV4 Hybrid lineup. After a 21-year hiatus, the Supra is returning to North America. Though Toyota teased this last year in England at the Goodwood Festival of Speed, the automaker officially confirmed the 2020 Toyota Supra at the North American International Auto Show in Detroit, Michigan, last month. Toyota promises the new Supra will nod to the 1967 2000 GT and the Supra that lived from 1993 to 2002, both in design and mechanics. But the 2020 Supra will also be a model all of its own. The new Supra will take its power from a 3.0-litre twin-scroll turbo six-cylinder, paired with an eight-speed automatic transmission with paddle shifters. This engine will throw down 335 horsepower and 365 lb-ft of torque and enable the Toyota Supra to rocket from 0 to 96 kilometers an hour in just 4.1 seconds. But the Toyota Supra has always been about design as much as it’s been about performance. Toyota promises eye-catching colours like red, yellow, and blue hues, though you’ll also be able to get the Supra in traditional colors like white and silver. The interior of the Supra is wholly race-inspired, including sports seats with integrated head restraints. The 2020 Toyota Supra will go on sale here at High River Toyota this summer. Early this year, Toyota announced that its 2019 Toyota Highlander SE — the sportiest trim in the Highlander range — would get a new special edition. This model is called the Nightshade special edition, and it injects a new pop of fun into the Highlander lineup. According to Toyota, the Nightshade special edition will be offered in three colors: Blizzard Pearl, Midnight Black Metallic, and Salsa Red Pearl. What special design features does the special edition model include? The 2019 Toyota Highlander SE with the Nightshade package will ride on 19-inch black alloy wheels. The black accents continue with black outer mirrors, a black trunk garnish, black window trims, a black Highlander badge, black door handles, a black rear spoiler, a black SE badge, a black all-wheel drive badge, and a black rear taillight. The 2019 Highlander, which can seat up to seven or eight passengers, is powered by a 3.5-litre V6 engine, mated to an eight-speed automatic transmission. The Highlander, including the SE model, prioritizes safety with Toyota Safety Sense. For more information on the Highlander, contact us at High River Toyota today. It’s no secret that the Toyota RAV4 carved out the compact crossover SUV segment when it arrived in Canada 22 years ago. But now, the 2019 Toyota RAV4, heralding in the fifth generation, seeks to revolutionize the segment with some major updates to improve versatility, handling, fuel economy, and comfort. For starters, the new powertrains offered on the 2019 RAV4 boost performance while simultaneously improving fuel economy. The new powertrains include the Dynamic Force 2.5-liter engine the Toyota Hybrid System powertrain. In addition, second-generation Toyota Safety Sense (TSS 2.0) is standard across the RAV4 lineup. This includes a Pre-Collision System with Pedestrian Detection, Full-Speed Range Dynamic Radar Cruise Control, Lane Departure Alert with Steering Assist, Automatic High Beam, and Lane Tracing Assist (new). In addition, Toyota has added even more features and functionality to the standard Entune™ 3.0 system, which now boasts Apple CarPlay™ compatibility. Toyota has “refined” and “re-defined” the 2019 RAV4 with an updated interior that feels more upscale and “premium” than ever before. The interior boasts user-friendly multimedia technology, sophisticated interior materials, and comfort and convenience features such as standard two-zone front heated seats and a wider centre console. The RAV4 is even available with a wireless charging pad for smartphones. 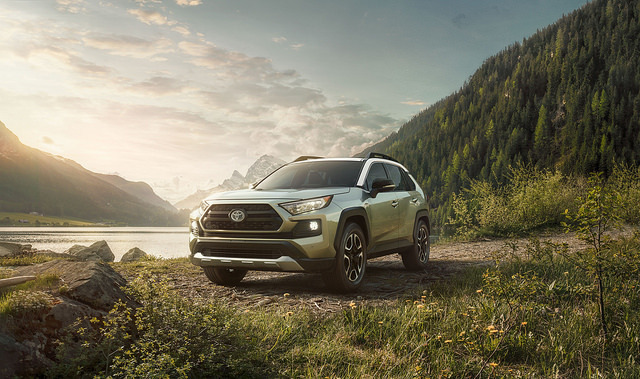 Test-drive the 2019 Toyota RAV4 at High River Toyota. Are you a frequent road tripper in need of a new set of wheels? 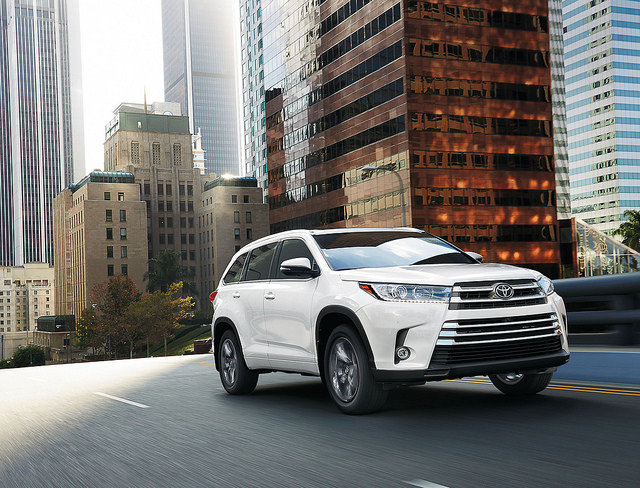 Enter the 2019 Toyota Highlander, Canada’s premier road trip vehicle. What makes the 2019 Toyota Highlander perfect for road trips? For starters, it can seat up to seven or eight passengers (depending on whether you go with the bench seat or captain’s chairs for the second row). Either way, you will have lots of space for luggage — especially if you fold down the rear seats during a solo or two-person road trip. Technology is also an important piece of the road trip puzzle, and the Highlander has plenty of it. The backup camera makes reversing in unfamiliar territory much safer while the 6.1-inch touch screen audio system makes connectivity on the go a piece of cake. Three zone independent climate control and available heated seats keep passengers comfortable on long trips. Test-drive the 2019 Toyota Highlander at High River Toyota. *Fuel efficiency estimates were determined using approved Government of Canada/Transport Canada Test Methods. Actual fuel consumption will vary based on driving habits and other factors. Learn more about Fuel Consumption Ratings. 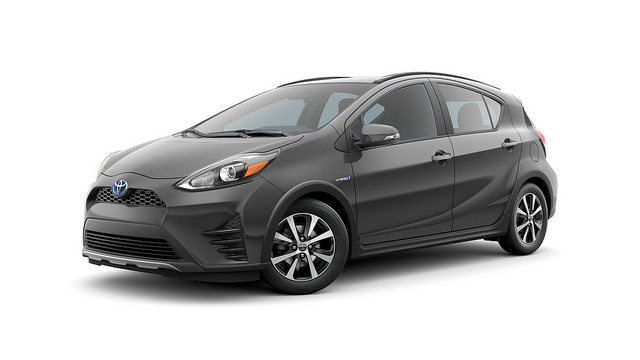 You can now test drive the 2019 Toyota Prius c at High River Toyota, which is the perfect city car for those who crave high efficiency in their daily commutes. Though small on the outside, the Toyota Prius c is surprisingly roomy on the inside, offering up to 484 L (17.1 cubic feet) of cargo space thanks to the 60/40 split folding second-row seat. Other interior features include the tilting and telescoping steering wheel, power door locks with keyless entry, and a wide range of entertainment technology. That technology starts with a 6.1-inch touch screen for the Display Audio System and continues with Bluetooth® connectivity, a USB audio input, and a 4.2-inch multi-information display. Safety is paramount in the 2019 Toyota Prius c. The standard Toyota Safety Sense C suite of systems includes Automatic High Beams, Lane Departure Alert, and the Pre-Collision System. Other safety features include nine airbags and a backup camera. Visit High River Toyota to learn more about the 2019 Prius c.
The 2019 Toyota Tundra is Canada’s fiercest pickup truck. Powered by a legendary 5.7-liter i-FORCE V8 engine that generates 381 horsepower and 401 lb-ft of torque, the new Toyota Tundra is capable of towing up to 10,000 pounds (that’s 4,535 kgs). Inside, the Toyota Tundra is packed with innovative technology, like the touchscreen audio and backup camera. The audio system in the 2019 Tundra includes USB and auxiliary inputs, AM/FM, and Bluetooth®, all of which can be controlled via steering wheel-mounted controls or the touchscreen itself. Navigation is available via a 7-inch touchscreen. Other tech features include keyless entry and available power tailgate lock. More importantly, the Tundra is loaded with innovative safety technologies, like available Blind Spot Monitor with Rear Cross Traffic Alert. Auto Limited Slip Differential and eight airbags come standard, as does the Toyota Safety Sense™ P suite of technologies; these include Lane Departure Alert, Automatic High Beams, the Pre-Collision System with Pedestrian Detection, and Dynamic Radar Cruise Control. The standard Star Safety System™ adds even more safety perks, such as Brake Assist, an Anti-Lock Brake System, Vehicle Stability Control, Traction Control, Smart Stop Technology, and Electronic Brake Force Distribution. 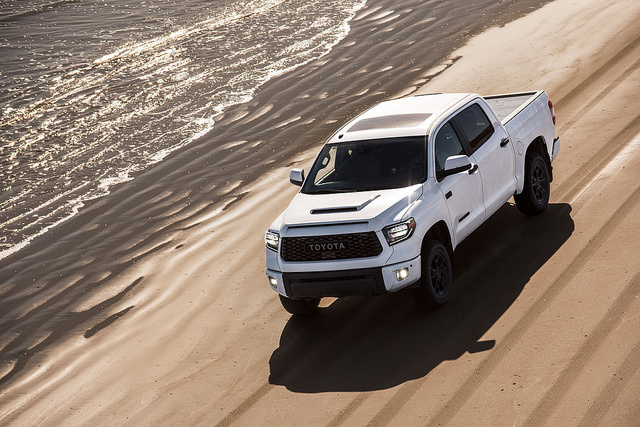 You can test-drive the 2019 Toyota Tundra at High River Toyota.